This information is about our yearly spring rec program. For information about our travel programs, please visit the Travel Lacrosse tab at the top of the page. 1. How old does my child need to be to play in the 2019 JTAA Lacrosse Spring Rec League? Is it based on age or grade? What are the cut-offs for US Lacrosse ages? We cannot accommodate any request to play in the program if the child is born after 8/31/2014 or before 9/1/2002. The program is not designed for players who will be playing for their high school lacrosse teams during the season. 2. When does the 2019 JTAA Rec Lacrosse season start and end? ANSWER: The Town of Jupiter considers Rec Lacrosse a spring sport with practices starting approximately late January or Early February (depending on age division) and the season is completed around the end of April. Tentatively, the first regular season game will be on Saturday February 23, 2019 and the last regular season game will be Saturday April 27, 2019. We play every Saturday during this time except 3/16/19 and 3/23/19 due to Spring Break. The official full game schedule will not be available until early February 2019. This is subject to change. 3. When does registration open for the 2019 spring rec season and where do I register my child? 4. What information do I need to register my child? ANSWER: You will fill out a short online form and will be asked to pay with a Visa or MasterCard credit card. One important item to have with you at the time of registration will be your child's new or renewed US Lacrosse membership number. It is required at the time of registration. This US Lacrosse membership is for your child, not for you as a parent. Each child that plays will need their own membership in his or her own name. You as a parent only need a US Lacrosse membership if you are coaching or are a board member in JTAA Lacrosse. For those who already have a current US Lacrosse membership for their child, please be aware that the membership must not expire prior to 4/27/19 or it will ask you to renew before you can continue with the registration process. We do not have access to your child's US Lacrosse membership, and cannot accept login access to your personal US Lacrosse account from you, therefore we cannot fix any US Lacrosse membership related issues. It is always best for you as parents/guardians to contact US Lacrosse directly before you attempt to register your child in our program. These issues are generally very minor in nature and can be fixed over the phone in just a few minutes. With our streamlined registration form and by having this information with you at the time of registration, the whole process will only take a few minutes. 5. What is the registration fee to play JTAA Lacrosse? 6. Are there scholarships or financial aid available to help me cover the cost of registration? 7. What is the refund policy for the 2019 spring rec season? ANSWER: Any refund requests must be made by email only to and must be received no later than December 31, 2018 for a full 100% refund. For all refund requests, there is also a mandatory JTAA $15.00 processing fee. There are no refunds starting January 1, 2019. There is a tremendous amount of work, costs, and deadlines that go into opening the season, and 12/31/18 is the absolute deadline for any refund request regardless of the reason. This deadline policy was approved by JTAA. 8. My child is trying out for one of the local middle school lacrosse teams in January. Can I hold a spot now with JTAA Lacrosse and cancel later? ANSWER: JTAA Lacrosse has grown dramatically in recent years and has a finite number of spots in every age group due to available coaches, field space, and other league factors. We must fill those spots on a first-come, first-served basis and cannot hold any spots without registering as it is not fair to others who want to register now and definitely play JTAA Lacrosse this upcoming season. Registering online and paying the registration fee at the time of registration is the only way to secure your spot with JTAA Lacrosse. Please keep in mind that if you register with us and then decide to play middle school instead, our deadline for refund requests is 12/31/18 and can be found above in FAQ# 7. We recognize that middle school lacrosse also has grown very fast in the past few years. With that, we know there are only so many spots on the middle school teams, and with many more kids trying out for those finite number of spots than have in past years, we realize that we will have more parents coming to us in January wanting their son to play JTAA Lacrosse after having not made their middle school team. We never want to turn away any kid and we will do our best to accommodate your late registration and make room on a team or make another team. None of this can be guaranteed but promise we will do our best to make it happen. Last season, statistically a majority of the children who played on their middle school lacrosse team also played JTAA Lacrosse at the same time, however only you know what is best for your personal family situation and schedule. JTAA Lacrosse is not affiliated with the local middle school lacrosse teams and are separate organizations. 9. Why are out of town players automatically put on a wait list? ANSWER: As a local community organization, JTAA is expected to serve the Jupiter/Tequesta residents first. Due to the popularity of this program, and the limited number of facilities and volunteers, JTAA was forced to adopt a new policy in September 2014 that automatically puts everyone on a waitlist when they register who live outside of the Jupiter/Tequesta area. JTAA Lacrosse did not turn away any out of town child in the 2018 season and we fully anticipate being able to fill everybody's spot who goes on the wait list for the 2019 season, but that cannot be guaranteed. 10. Where are games and practices held? ANSWER: All games for boys and girls will be held at Jupiter Community Park (JCP), Lighthouse Park (LHP), or Jupiter High School (JHS). The practices for boys and girls will be at either Jupiter Community Park or Lighthouse Park depending on your team. 11. Where are the away games and how much travel is involved? ANSWER: Starting in the 2019 rec season, we will no longer have away games as we are now an in house program and will become our own league. All games will be at JCP. This website and our Facebook page has information on why we changed to this format. 12. How often will the teams meet for practice and how often will they play games? ANSWER: This depends on the division your child is playing in. Most age divisions practice 2 times per week on weeknights and practice start times will be 530pm or 700pm depending on your age group. Games are held on Saturday and game start times will be anywhere from 900am to 500pm. The younger age groups generally play earlier and the older age groups play later in the day, but this is never guaranteed. Many teams ask to play 2 games on Saturdays and we accommodate when possible. You can expect to play two games on a Saturday at least once this season. We play games every Saturday except 3/16/19 and 3/23/19 due to Spring Break. We also have a few weeknight games for each team during the season and those are generally on Tuesday, Wednesday, and Thursday nights with start times of 630pm or 730pm.Your team will likely have 4 to 6 weeknight games sometime during the season in addition to the regular Saturday games. The weeknight games will also be at JCP. The practice schedules will be available from your coach in late January and the official season game schedule will not be available until early February 2019. This is subject to change. 13. Does my child need to be an experienced player or are new players welcome? ANSWER: Lacrosse is the fastest growing sport in the country. Of course, new players are very welcome! Our intention is for players to first have fun and to learn the game of lacrosse in a rec league environment. Our coaches stress fundamentals such as passing, catching, and ground balls. It is also our intention that all players will play regardless of their ability and experience. We want this to be a fun and interactive experience for all players at all ages. US Lacrosse's Parent Guide offers a wealth of information for parents on all aspects of the game. 14. Can my child play down in a lower age division, or can my child play up in a higher age division? ANSWER: No. Due to safety issues and fairness to the other players, all players will be placed in their respective age divisions according to their birth date and this policy will be strictly enforced. JTAA, JTAA Lacrosse, and SFYLL take the issue of "playing down" very seriously and we will not accommodate requests to play in a lower age division regardless of the reason. ANSWER: We do not encourage play up but it can be allowed under some very special circumstances and the guidelines will vary from year to year, depending on how many registered players we have in the two respective age groups and other factors. For any potential play up requests, please email jtaalacrosse@gmail.com and we will discuss further. 15. Do you have player evaluations and draft process to select teams? Yes. Boys in all age divisions will be asked to participate in player evaluations on January 27, 2019. Coaches and board members will place players on teams to help ensure that each team is as competitive as possible. You will receive an email in early January confirming the date and time of the player evaluations. These are evaluations, not try-outs. Every child who wants to play will play in our rec program. These player evaluations are necessary so that skill level can be distributed as evenly as possible among the teams. It is very important that all players be evaluated. We would rather have a player attend for a portion of their session than not come at all. To be fair to all coaches and players alike, if your son still cannot make the player evaluation session, they will be selected to a team through a blind draft "hat pick" process at the end of the draft. The coach that is due the next pick at the end of the draft process will be given the first "hat pick". JTAA Lacrosse's goal is to be as fair as possible in team selection and the "hat pick" rule helps to ensure that fairness and the integrity of the process. There are no exceptions to the "hat pick" rule. 16. How do I request that my child be placed on a specific team or with a specific coach? ANSWER: Unfortunately, we cannot place kids on specific teams by request before the season starts. It is against our program rules and it helps to upset competitive balance. Each coach on the field is properly certified and qualified to coach your child. You can email us at jtaalacrosse@gmail.com to discuss your specific situations such as carpooling and kids being on the same team with the coaches in your age division. We will present those requests to the coaches in your age group when teams are selected to work out a fair solution to all. In the 2018 season, just about all requests worked out for everyone. 17. Does JTAA Lacrosse have All Star teams? COMING FOR 2020.... ANSWER: For those more experienced players, we may also offer an All Star team for boys and girls and more details will be available once the season approaches if there is enough interest. The games are played on two Sundays towards the end of the season and there will be multiple games for each team on those two Sundays. To be eligible to play for the additional All Star team, the player must also be registered and play in the regular Rec games on the same age division rec team as well as attend practices of both the rec and the All Star team. We cannot accommodate players who only wish to play on the All Star team and not the corresponding rec team. We did not participate in All Stars in the 2018 rec season and do not anticipate doing so in the 2019 season. 2020 Details Coming Soon! 18. Does the youngest division 6U play a full season of games? ANSWER: Yes. The 6U Developmental Program is designed to introduce this age group to the sport of lacrosse. They will learn basic lacrosse concepts and skills through a series of drills and activities taught in a small group setting. Protective equipment (i.e., helmets, pads) is used in the 6U program. The instruction and activity level is age appropriate and prepares the young players for the 8U program. The 6U teams also play at JCP and will play the same number of weekend Saturday games as the older divisions do. 19. How many players are on a lacrosse field and what are the positions? ANSWER: Full field lacrosse is generally played with ten players (12 for girls) on the field for each team. We have transitioned to an in house program focusing on small sided play to better develop young players. We are playing the small field 7v7 format for the 2019 rec season. There will be full field events later in the season for 12U and up. 6U is with 5 players and a Shot Blocker instead of a goalie. 20. What are Wall Ball Drills? 21. Where can I find rules for lacrosse? ANSWER: For youth lacrosse, please visit http://www.uslacrosse.org/rules for up to date information on the rules of the game at the youth level. Each season your head coach will be provided with any new rules for the year and/or any additional rules that have been adopted by our league. 22. Is JTAA Lacrosse going to enforce the newly adopted NCAA Men's Rule Change for the HS 4" Stringing Rule that started in 2017? ANSWER: Possibly. The rule will be considered for the 2020 season and the outcome will be announced before the start of the season. The rule will eliminate U and V throw strings. 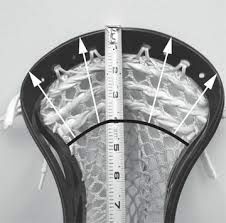 The rule change is: Change to RULE 1-SECTION 19: "Any additional strings or laces (e.g., shooting strings) must be located within 4" of top of the crosse. No more than one sidewall string on each side is allowed. No crosse may have any tape affixed to the plastic. This does not include the crosse of a goalkeeper." See http://i.imgur.com/vMPk3aJ.jpg for a picture. 23. What equipment do Boys and Girls lacrosse players wear? We provide each player with a uniform jersey, uniform shorts, practice jersey, and a shooting shirt. NOTE ON BALLS: All age groups use the standard size lacrosse ball meeting NOCSAE standards. Balls for boys and girls are generally similar in size and weight, however they differ in color. The color of the ball is typically white for the boys and yellow for the girls. Balls may measure between 7 3/4 and 8 inches in circumference and should weigh between 5 and 5 1/4 ounces in weight. JTAA Lacrosse provides all balls. 24. Will JTAA Lacrosse provide player equipment or will players have to furnish their own equipment to play? NEW PLAYERS: For all new 6U and up players to the sport, we highly suggest looking for starter sets of pads and gloves, and less expensive beginning sticks, all of which can be found in local sporting goods stores and widely available online. You do not need to spend a fortune on equipment for the first year player. Many parents of first year players have borrowed equipment from older players that they are no longer using, and have also found excellent used helmets, sticks, and other equipment on eBay, Craigslist, Letgo, and Offer Up. If you are wanting to sell or donate your used equipment, or if you are looking for used equipment, please visit our online exchange. 25. JTAA Lacrosse used to furnish helmets to those who needed them. Do you still offer helmets? ANSWER: No, JTAA Lacrosse does not offer helmets to borrow, rent, or for sale. 26. For boys lacrosse this season, can my son use his box lacrosse helmet or hockey helmet? ANSWER: No. Every player in our league must use NOCSAE approved field helmets only. 27. Why is a US Lacrosse membership required to play JTAA Lacrosse? ANSWER: For insurance and league rule requirements, it is mandatory for all players, head coaches, asst coaches, referees, and league officials to be current members of US Lacrosse during the 2019 season. We must have 100% participation with every player and coach. This is such a serious issue for JTAA that you will not be able to register your child without providing your child's current and valid US Lacrosse membership number at the time of initial registration. The season runs through Saturday April 27, 2019 so for the 2019 season, your US Lacrosse membership must be valid through and including 4/27/19. There are no exceptions to this policy. 28. How do I provide JTAA Lacrosse with the US Lacrosse Membership number? ANSWER: This is a requirement at the time of registering your child to play JTAA Lacrosse. The system will prompt you for that information as soon as you choose to register for the sport of lacrosse. Please make sure you sign up for a new membership or renew your current membership with US Lacrosse prior to attempting to register with us online. The US Lacrosse membership must be for your child and the registration system will not accept your adult US Lacrosse membership number if you have one. For all coaches to submit their valid US Lacrosse membership to us, please click here. Scroll down until you see 2019 US Lacrosse Membership Number Coach Registration and click Begin Registration (Green Button). 29. Do you require proof of my child's health insurance coverage to register for JTAA Lacrosse? ANSWER: No. We do not require your child's health insurance information because your child is a member of US Lacrosse that is described above in #27 and #28. This US Lacrosse membership provides insurance in order for your child to be allowed to play JTAA Lacrosse. US Lacrosse partners with Bollinger Insurance to provide exclusive on-the-field coverage for all US Lacrosse members. The US Lacrosse Member Insurance Program provides General Liability and Accident Medical Insurance to all members while participating in covered amateur lacrosse activities. The Insurance Program has been developed by the US Lacrosse Insurance/Risk Management Committee to establish high quality insurance standards for the sport and to provide protection to all registered members during the term of their membership. 30. Is a health exam or physical required to play JTAA Lacrosse? ANSWER: No. JTAA does not require proof of a health or physical exam to accompany your registration for any JTAA sport. At the time of registration, JTAA asks you to provide emergency contact information and to list any medical conditions and allergies your child has that you want us to be aware of. It is always advisable to contact your child's coach about any medical issues that you think he or she may need to be aware of. 31. Does JTAA Lacrosse offer scholarship opportunities for graduating high school seniors? 32. Does JTAA Lacrosse offer a summer camp once the season is over? ANSWER: No, however the Town of Jupiter offers a youth lacrosse summer camp in July. You can find more information about it at http://www.jupiter.fl.us/index.aspx?NID=446 You can also find a complete nationwide list of US Lacrosse approved summer camp listings here. 33. Are there any paid employees in JTAA Lacrosse? ANSWER: No. JTAA Lacrosse is run exclusively by volunteers who do what is in the best interest of your child first and foremost. JTAA Lacrosse is non-profit and do not put financial interests in mind first as for profit franchise youth leagues must do. We are always looking for help to better and grow the experience for the kids. 34. What is the philosophy of JTAA Lacrosse? ANSWER: JTAA was founded to provide athletic activities for school age children of the Jupiter and Tequesta community. It is also the purpose of JTAA to help participants to develop strong, healthy bodies and minds; the highest type of sportsmanship, understanding of and respect for the rules; courage in defeat; modesty in victory; and themselves into becoming good citizens. JTAA believes a youth program should be, as its name implies, a program for the kids. To win at any cost may be the proper attitude for the highly skilled professional, but it is contradictory to the basic objectives of JTAA Lacrosse. Stacking teams, tryout camps, all-star powerhouses, etc., may produce a climate of excellence for a talented few, but will not in the long run be beneficial to the vast majority of young people involved. The JTAA "Tide" Lacrosse program was established in 2001 in response to the growing needs of the community. JTAA Tide Lacrosse develops skills, tradition and respect for the game, sportsmanship, manners and integrity towards others, while instilling a love for the sport of lacrosse. 35. Are you looking for coaches? ANSWER: Absolutely. Please email or contact any current board member and we will provide details on all coaching positions (Head Coaches and Asst Coaches) available for the upcoming 2019 rec season. All coaches must have a valid US Lacrosse Membership Number valid through the end of the 2019 rec season. Refer to Answer #27 and #28 above for more information about your US Lacrosse Membership and how to provide us with your membership number. 36. Can I sponsor a team or make a donation to JTAA Lacrosse? ANSWER: Yes! We are actively seeking sponsorships at all levels! Our team sponsorship is currently available at $600 per team and includes your company name on the back of your team's practice pinnies or end of the season shirts. Please email or contact any current board member to find out how to financially help with the season. The deadline for the team practice pinnie sponsorship is 1/6/19. 37. Are you looking for new board members? ANSWER: Yes! We are always seeking new board members who would like to help guide, advise, and grow this lacrosse league well into the future. The election of new board members is done at the annual May board meeting. Board members are elected to a 3 year term. Please email or contact any current board member to find out how to put your talent to work with JTAA Lacrosse. 38. Are you looking for new lacrosse officials to officiate your in-house rec and club travel games? ANSWER: Yes! If you love the game of Lacrosse, then consider joining our JTAA Lacrosse Officials Association (JTAALOA) and become a lacrosse official for our in-house JTAA Rec Lacrosse League and our JUPLAX travel lacrosse program. It's a great way to stay in the game. You need not be an ex-player or coach to become a great official and have a memorable officiating career. Working around student-athletes at all levels of lacrosse is gratifying, plus you will develop life long friendships with other officials who share your passion for the game. Prior officiating experience is good but not required. Our in-house training program for 14 year olds on up to adult will prepare you for an enjoyable and successful start to an officiating career. Officiating lacrosse is also a great way to get and stay in shape, be a positive role model to student-athletes, retain your competitive edge and earn additional income. Current high school players who officiate our lacrosse games know it makes them better players once they learn the game from an official's perspective. We're taking youth lacrosse in Florida to an entirely new level. We're just getting warmed up. We are looking for quality, not quantity. If you feel like you have what it takes to join us, we want to hear from you today. 39. I don't see a telephone number listed on the website. Who can I call? ANSWER: JTAA Lacrosse does not have a central office so there is no main telephone number to call. JTAA Lacrosse is an organization run exclusively by volunteers who put in countless hours year round to make your child's rec lacrosse season a success. We communicate primarily by email. If you have a question or concern, please contact us by email and we will be happy to answer your question or we will forward it to the person who can best help with that particular situation. The vast majority of questions and concerns can easily be answered by email or by contacting a board member or coach directly. We ask that you respect this policy as these volunteers have career and personal responsibilities and rest assured will answer your question as soon as possible. If a phone call becomes necessary, someone with knowledge of your specific situation of course will call you. 40. Who should I contact? What email address is best to use? 41. What is your mailing address? 42. I don't see my question here. Who can I ask? ANSWER: Please email or contact any current board member and we will be glad to answer any questions you may have. These policies and guidelines are not designed to be restrictive, but are in place to ensure your child has a fun, safe, and rewarding experience learning the game of lacrosse in a youth rec league environment. There is a reason we are the largest youth rec lacrosse program in the southeastern United States and we greatly appreciate your help and cooperation in continuing to help JTAA Lacrosse be a great experience for many years to come. Thank you from JTAA Lacrosse. "The Premier Youth Rec Lacrosse Program in South Florida"